CarGurus has 3,375 nationwide Panamera listings starting at $20,900. For the well-heeled executive, Porsche again offers its subtly over-the-top Panamera sedan for 2015. After some significant styling, power and interior upgrades in 2014, this plush 4-passenger 4-door comes with a unique hatchback rear end that allows a little more luggage/cargo space (44.6 cubic feet with the rear seatbacks folded), while the recently introduced Executive trim levels offer some 5.7 additional inches of rear legroom on top of a few added comfort and convenience items. Thus the standard length for the Panamera non-Executive lineup runs some 197.4 inches of overall length, while the Executive trim is stretched to 203.4 inches of overall length. For 2015, the Panamera Turbo S and Turbo S Executive trims return to the lineup, joining the Base sedan, the S Sedan, the 4 Sedan, the 4S Sedan, the S E-Hybrid Sedan, the sporty GTS Sedan, the 4S Executive Sedan, the Turbo Sedan and its Executive upgrade. Those trims with the “4” designation, as well as the various Turbo-designated variants, carry standard full-time all-wheel drive (AWD), while the rest remain delivered with rear-wheel drive (RWD). Besides the return of the Turbo S pair, a new wheel design based on the 911’s Turbo II design and a few tweaks to interior materials and techno-features, Porsche is holding any further changes for the 2015 Panamera stable close to the vest. Power-wise, the Base Sedan and the AWD-toting Panamera 4 Sedan each pack the returning normally aspirated 3.6-liter V6 engine that's mated with the ubiquitous 7-speed dual-clutch auto-manual transmission (PDK) to pound out 310 hp and 295 lb-ft of torque. Mileage is estimated at 18 mpg city/28 highway in the RWD Base, while the AWD 4 Sedan is estimated to get 18/27, with said mileage in each case boosted by auto engine stop-start technology, which means the engine shuts down at a stop and automatically re-starts when the gas pedal is pushed. The 2015 Panamera S Sedan and its 4S Sedan and 4S Executive Sedan siblings are expected to again pack the 3.0-liter twin-turbocharged V6 managed by the ubiquitous 7-speed auto-manual transmission. Look for 420 hp and 384 lb-ft of torque from this peppy turbo 6, with mileage running an estimated 17/27 in both RWD and AWD iterations. The sporty AWD Panamera GTS, meanwhile, is slated to return toting a non-turbocharged 4.8-liter V8 engine, again matched up with the 7-speed auto-manual transmission. Expect 440 hp and 384 lb-ft of torque from this hefty V8, while mileage figures remain estimated at 16/24. 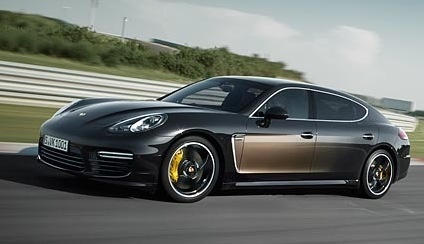 Again standard in the AWD 2015 Panamera Turbo Sedan and (also AWD) Turbo S Sedan, as well as their respective Executive Sedan counterparts, is a 520-hp twin-turbocharged V8 powerplant that combines with the 7-speed auto-manual to power out 516 lb-ft of torque. Mileage drops to 15/24 with this turbocharged mastiff, but you’ll get from 0-60 in less than 4 seconds, which ought to allow a few extra minutes of sleep before driving out to the polo field. Finally, the RWD 2015 Panamera S E-Hybrid Sedan, which as of 2014 carries plug-in capability, again totes a supercharged 333-hp 3.0-liter hybrid V8 engine mated with a 95-hp electric motor that adds up to 416 combined ponies. Managed by the standard 8-speed shiftable automatic transmission, this hybrid engine pounds out 435 lb-ft of torque and will scoot to 60 mph in a respectable 5.2 seconds using both gas and electric powerplants. Additionally, this princely Porsche plug-in can cruise up to 20 miles at 84 mph using only the 9.4kWh lithium-ion battery pack and electric motor, though its 0-60 time won’t be impressive. Further, a driver-selectable EV mode can be engaged for all-electric driving in city traffic, resulting in a Porsche-touted average of 33 mpg. Oh, and besides getting juiced up via the V8 engine and regenerative braking, the S E-Hybrid Sedan can be plugged in to a 240-volt charging system for a fully recharged battery in about 2.5 hours. Since we’re talking Porsche luxury here, look for the latest Panamera generation to boast, depending on the trim chosen, 18- or 19-inch alloy wheels, a power sunroof, heated power-adjustable mirrors and a rear spoiler outside, with leather upholstery, full power accessories and heated power-adjustable front seats with memory for driver's settings gracing the interior. And all trims, of course, sport cruise control and telescoping tilt-wheel steering, as well as a remote garage door opener, rear parking sensors, dual-zone climate control (with extended cabin heating), an auto-dimming rear-view mirror and a cooled storage compartment. A standard voice-activated navigation system with 7-inch touchscreen also adorns all Panamera variants, as do Bluetooth hands-free technology and a 4.8-inch driver-information display. For entertainment during the ride, there’s a 235-watt stereo system that sports 11 speakers and an auxiliary audio input. Higher trims, furthermore, add stuff like adaptive headlights, a sport exhaust system, steering-wheel-mounted paddle shifters, ventilated front seats, 4-zone climate control, sport front seats, upgraded cabin accents and sound insulation, and soft-close doors. Upper-echelon trims also carry adaptive suspension dampers, with the S E-Hybrid further tossing in its unique adaptive air suspension system. Also gracing the 2015 S E-Hybrid Sedan is Porsche’s Car Connect interface to monitor various battery-charging (plug-in) functions via your smartphone, along with hybrid-specific gauges and Power Steering Plus (Servotronic) for less stress on the old forearms when making stately 3-point turns in the country-club parking lot. Options should again run the gamut from a heated steering wheel to rear-seat DVD entertainment, from a surround-view camera to refrigerated cupholders, and from 17-speaker Burmester premium sound components to ceramic composite brakes. Additionally, the available Sports Chrono Package throws in analog and digital stopwatches and a Sports Plus driving mode with launch control, while the Sport Design Package boasts an upgraded front fascia with wider intakes, not to mention heftier side skirts. And, as usual, each trim can be customized with nearly unlimited interior appearance options. Standard safety equipment slated to return aboard all Panamera variants includes 4-wheel antilock braking (ABS), traction and stability control, side-mounted and head curtain airbags, daytime running lights and self-leveling high-intensity-discharge (HID) headlights. Adaptive cruise control, as well as lane-change assist and lane-departure warnings, again return as safety options for 2015. What's your take on the 2015 Porsche Panamera? 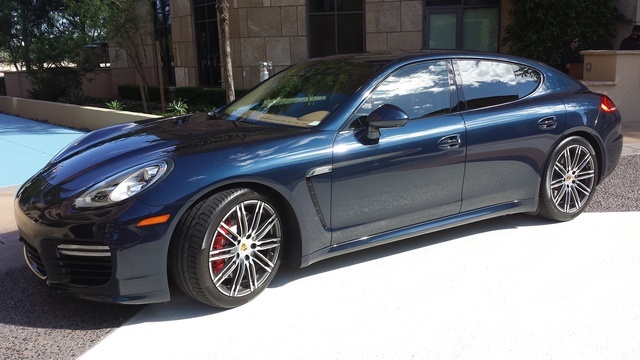 Have you driven a 2015 Porsche Panamera? Can We Sell Our Porsche Panarama On This Site?